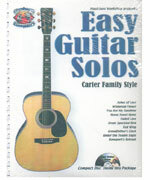 If you enjoy the 'Carter Family Style' you'll love this lesson! It's basically the old style of strumming the chords while you weave in the melody notes. It's fun, easy & you'll really learn how melody relates to chords! This course�taught by Dan Huckabee�contains a one-hour cassette and tablature booklet and is designed for the beginning or intermediate guitar player. Presented like a one-to-one private lesson; these are nice, well thought out arrangements that are easy and fun to play. The lessons are simple to follow and take you step-by-step, one phrase at a time, explaining every detail clearly, slowly, and simply. You won't have any problems with this one, even if you feel like you're all thumbs! Includes: Under the Double Eagle - Ashes of Love - You Are My Sunshine - Home Sweet Home - Faded Love - Great Speckled Bird - Redwing - Grandfather's Clock - Bonaparte's Retreat(CD & Tab) -------------------------------------------------------------------------------- About Dan Huckabee Dan Huckabee, has a degree in Music from The University of North Texas. He won the National Dobro Championship, & has played with The Allman Brothers, Lyle Lovette, Nancy Griffith, & Robert Earl Keen Jr, just to name a few. Dan founded Musician's Worskhop in 1973, teaches Guitar, Dobro, Mandolin, & Harmony Singing at The University of Texas Informal Classes, has taught workshops & seminars at festivals all over the United States, & has authored over 250 music instructional products. So get comfortable & let Dan's lifetime of musical experience guide you through everything you need to know in the quickest & easiest way possible!